With the growth and evolution of the German panzer force, it was realized that there is a need for dedicated and mobile anti-tank weapons to be a part of new armoured formations. As early as March of 1940, Germans produced first self-propelled anti-tank gun mounted on tank chassis – Panzerjager I armed with ex-Czechoslovak 47 mm Pak(t) 36 gun that used PzKpfw I Ausf B tank chassis. The vehicle was followed by Marder I vehicles that used captured French tank chassis, Marder II that used various PzKpfw II chassis and Marder III that used ex-Czechoslovak PzKpfw 38(t) chassis. All Marders were armed with German made 75 mm Pak 40 or captured Soviet 76.2 mm Pak 36(r) guns and offered minimal protection for their crews. All those vehicles were created in order to increase the mobility of anti-tank weapons by mounting them on variety of available and often obsolete tank chassis. They were the first generation of tank destroyers/tank hunters and were all seen as ..interim solution” implemented to fill the gaps until better designs can be introduced into service. The real need was for a dedicated and purpose build tank destroyer/tank hunter that could carry large calibre anti-tank weapon and offer full protection for the crew. The concept was to utilize existing tank chassis and mount it with a low superstructure that would house the main armament, ammunition and crew. Lack of turret would allow this vehicle to carry large calibre gun that could not be normally mounted in the turret. Early Sturmgeschutz III followed that concept and proved to be a successful tank destroyer, while being originally designed as an infantry support vehicle. In March of 1942, Stug III Ausf F, armed with 75 mm L/43 and later with L/48 gun, entered production. It was not only an assault gun but also a badly needed first purpose build tank destroyer. It was followed by Ausf F/8 and finally by Ausf G. All three models proved to be very successful tank destroyers and remained in service to the last days of war. In December of 1942, new tank destroyer with 100 mm frontal armour, armed with 75 mm Pak 42 L/70 gun (variant of the gun that was used to arm the Panther) and based on PzKpfw IV was requested by the Waffenamt. The vehicle was to have low silhouette with main gun mounted in a superstructure. It was to be the first vehicle of the second generation of tank destroyers / tank hunters. Jagdpanzer IV was an improved and modified version of Stug III, designed as eventual replacement for it. The new vehicle was designated as Sturmgeschutz neuer Art mit 7.5cm PaK L/48 auf Fahrgestell PzKpfw IV (Sd.Kfz.162) but was also known as Jagdpanzer E 39 and more commonly as Jagdpanzer IV. Work on its design took place in early 1943 and on May 13th of 1943, Vomag . (Vogtlandische Maschinenfabrik AG of Plauen) produced a wooden mock-up, which was show to Hitler in September of 1943. The main role of the new vehicle was to be a tank destroyer. First soft steel prototype was ready in October of 1943, which was then shown to Hitler as well. In December of 1943, final prototype of Jagdpanzer IV was ready and Vomag was ordered to start production as soon as possible. The first vehicles of 0-Serie (pre-production test series) had front plate with rounded sides (curved corners) and were armed with 75 mm Pak 39 L/43 gun without muzzle break. First production vehicle was produced in January of 1944, on modified PzKpfw IV Ausf F chassis and was designated as (leichter) Jagdpanzer IV Ausf F (Sd.Kfz.162). It was armed with 75 mm Pak 39 L/48 gun (with muzzle break) and two 7.92 mm MG42 machine guns. Due to the production problems with 75mm L/70 gun and its adaptation for use in Jagdpanzer IV, readily available 75mm L/48 gun was mounted instead. As a result of slow development of Jagdpanzer IV and great need for new armoured fighting vehicles new vehicle was created. It was done by installing modified Stug III superstructure on PzKpfw IV chassis creating Sturmgeschutz IV, which was used in the same manner as Stug III. Work on 75mm L/70 armed Jagdpanzer IV began in January of 1944 and lasted until April of 1944. Work on second Jagdpanzer IV armed with 75 mm L/70 gun started in June of 1944 and ended in July of 1944. Both vehicles then entered production in August of 1944. Jagdpanzer IV was in production from January to November of 1944 with total of 769 to 784 produced by Vomag (chassis number 320001 to 321000). Average output per month was around some 70 vehicles. When the production of Jagdpanzer IV (Sd.Kfz.162) was stopped, 26 additional chassis were left unused and were converted to other special purpose vehicles. In August of 1944, two new variants armed with 75mm L/70 gun entered production – Jagdpanzer IV/70(V) (Sd.Kfz.162/1) and Jagdpanzer IV/70(A) (Sd.Kfz.162/1). Both were also known as Panzer IV/70(V) for Vomag and Panzer IV/70(A) for Alkett. From August of 1944 to March/April of 1945, 930/ 940 Panzer IV/70(V) vehicles (chassis number 320651-321000 and 329001 to unknown) were made and from August of 1944 to March of 1945, only 278 Panzer IV/70(A) vehicles (chassis number 120301 to unknown) were made. Vomag of Plauen produced IV/70(V) with monthly rate of 103 vehicles. Nibelungenwerke of St.Valentin (Austria) produced IV/70(A) with monthly rate of 34 vehicles. By December of 1944, new variants, especially Vomag completely phased out its predecessor armed with 75mm L/48 gun. In August of 1944, Hitler ordered that production of PzKpfw IV in its battle tank form was to be stopped by the end of the year and instead Jagdpanzer IV was to be produced with a monthly rate of 800 vehicles. Production of PzKpfw IV was not stopped and it remained in production till March of 1945. 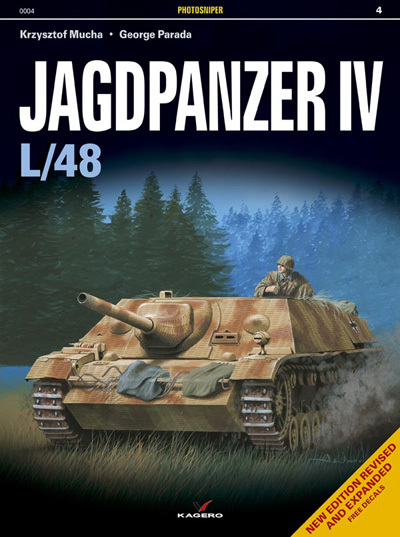 Since the beginning of this project, Heinz Guderian, who was the Inspector-General of the Panzertruppen, was against Jagdpanzer IV as he saw Stug III to be sufficient and was against diverting the resources from PzKpfw IV tank production. As a result, Jagdpanzer IV entered production but at much slower rate of production as originally planned. New Jagdpanzer IV used basic chassis and drive train of PzKpfw IV and only front hull had been modified by replacing the original vertical front plate with two-piece sharp edge nose. The upper nose plate armour was 60mm thick and lower 50mm thick, instead of original 50mm thick vertical plate. In addition, interior layout of components inside the hull was changed to accommodate the new superstructure. The changes included changed location of fuel tanks, ammunition racks and floor escape hatch and elimination of engine that powered the turret along with new heating and ventilation system. The superstructure was made up of sloped plates, what almost doubled the protection. All parts of superstructure were made from large interlocking armour plates that were welded together making manufacturing process easier and faster. The 75 mm L/48 gun was mounted in the frontal plate along with two machine gun ports (with conical covers) and driver’s periscope. The main gun was mounted 20 cm offset to the right and had limited hand traverse of 12 degrees to left and right. The gun could be elevated 15 degrees up and lowered 8 degrees down. Side plates were 30 mm thick and frontal plate was 60 mm thick. In May of 1944, upper nose plate armour was increased to 80 mm along with frontal plate and side plates were increased to 40 mm. Thick and well-sloped armour offered adequate protection for the crew of four – commander, gunner, loader and driver. Additional protection was offered by vehicle’s 1.85 m low silhouette. 79 rounds of 75 mm ammunition were stored inside along with 1200 rounds of 7.92 mm ammunition. Its maximum road speed was 40 km/h, while its weight was around 24.5 tons. Early vehicles had some minor defects but those were soon solved. From March of 1944, only one 7.92 mm MG42 machine gun was installed (on the left side of the gun). From May of 1944, the muzzle break was eliminated as the dust cloud crated after firing reduced the visibility and gave away the position. This was done after crews complained and often removed the muzzle breaks in the field. In September, number of return rollers was decreased to three per side. Many vehicles were fitted with Schurzen and were factory applied with Zimmerit anti-magnetic paste until September of 1944. Jagdpanzer IV was also produced in command version (Befehlswagen) and was fitted with additional radio equipment operated by fifth crewmember – the radio-operator. In September of 1944, experimental Jagdpanzer IV (neuer Art Starr) armed with rigidly mounted 75mm Pak 39 L/48 gun was tested. Two prototypes were tested but many problems were encountered and further tests were carried on Jagdpanzer 38(t) Hetzer.